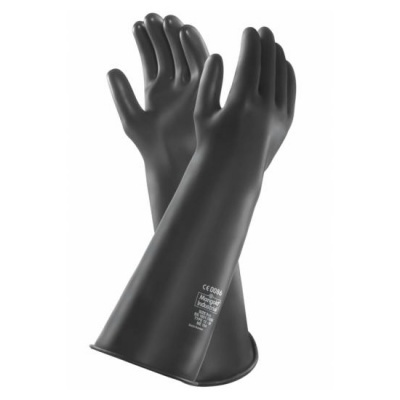 With a robust design that provides protection against both mechanical and chemical hazards, the Marigold Industrial Emperor ME104 Medium Duty Chemical Resistant Gauntlets are ideal for a range of chemical work applications. Not just strong, these gloves are flexible and elastic as well, allowing precision handling and reducing the incidence of tears. The Marigold ME104 are designated Category III gloves, meaning they have a complex design intended for the highest levels of risk. The Marigold ME104 Gauntlets are available in four different sizes. Please measure the circumference of your hand around the knuckles (excluding the thumb) with your hand open and your fingers together, and the length of your hand from the tip of your middle finger to your wrist. The Marigold ME104 have an overall length of 432mm.